A fine cool day perfect for football. The two teams, the Japan Samurai and Pakistan Shaheens, both suffered similar first round defeats, so on paper this should be a even contest, but they have two different styles. The Samurai lack tall key positional players to present as a focus, whilst the Shaheens lack the all round pace. The game started as an even affair with end to end movement for little result. He Samurai used the Western (sunny) wing to good effect but the Shaheens worked the ball back. For a while it looked like the taller Pakistani players Like #17 Haseeb Qureshi and #9 Zain Siddique were going to take control, playing a kick behind the play. Gradually the superior speed and teamwork of the Samurai allowed them to move the ball with less opposition and put some some majors on the board. The quarter highlight was a big thump out of the centre bounce and running kick passes that ended in a goal for the Samurai. Nearly as good was a great snap from #30 that bounced truly to give the Samurai a good lead for the quarter. Their best player was #1 Masaya Nakamura who popped around then ground and featured in a good lead-mark-goal combination. Play opened up in the second quarter with some classical football resulting and a lift in tempo. The Samurai played some sharp teamwork football but couldn’t penetrate due to some good defense and the work of #9 Zain Siddique taking good marks around the ground. 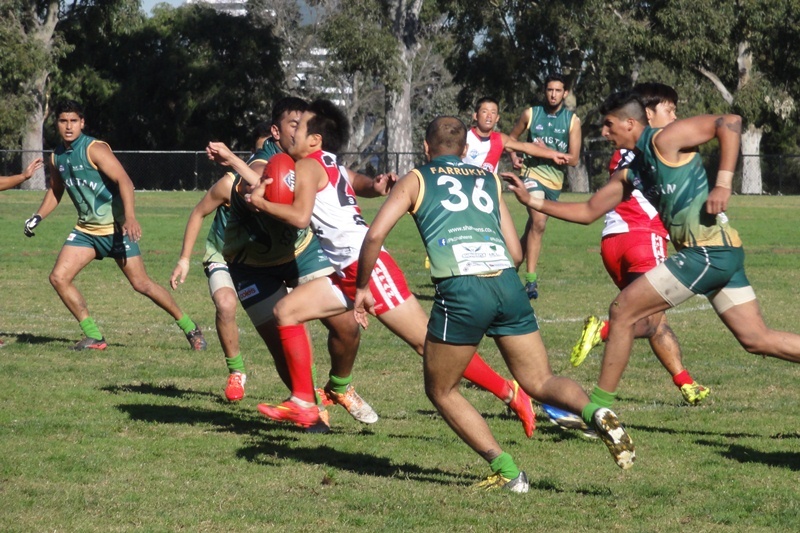 It was a good result for Pakistan in restricting Japan to just one goal for the quarter and countering the the athletic work of #1 around the ground. A measured speech to the Shaheens seemed to have been effective. They knew if they lifted a little they could build on their second quarter’s good work they could chip away at the Samurai’s lead. Better all round endeavour resulted in the ball being pushed forward and #35 Humza Ali getting his kick away for a goal. #17 Haseeb Qureshi took some good defensive marks and the ruck division lifted. #17 Haseeb Qureshi laid the foundation to Shaheens older style of mark and long kicking which was providing results over the Samurai. The Samurai rebounded with great roving from #12 Michito Sakaki and at times perhaps #1 Masaya Nakamura was guilty to attempting too much if that is possible. #15 Daichi Tanabe snapped truly from distance but was countered by an even better effort, a very long goal from #9 Zain Siddique that bounced through. The Japanesse were running as strong as ever but maybe they were getting predictable. The Shaheens had now matched the Samauri for three quarters and the lead was not great. The Samauri were immediately into a great roving attack by #12 Michito Sakaki who figured prominently in this last quarter. The intensity lifted markedly. #17 Haseeb Qureshi provided great example along with #9 Zain Siddique who failed to drill a difficult chance. The momentum was with Pakistan. Now it was the Samurai’s turn to defend and rely on rebounding out of defense. A sramble goal to the Samurai failed to relieve the pressure and the Shaheens fought out the game. Certainly if the Shaheens can play like the last three quarters of the game they will be competitive. The Japanese continued on from past performances with good running football, use of handball, leading and marking. They need to keep working hard on these skills to perfect the high possession game and compensate for their lack of tall key position players.